There’s nothing like the satisfaction that comes from using garden products to make items that are useful and attractive. In previous posts we’ve talked about pressing flowers, using plant trimmings for natural dyes and making garden potpourri (search ‘garden crafts’ on this blog). 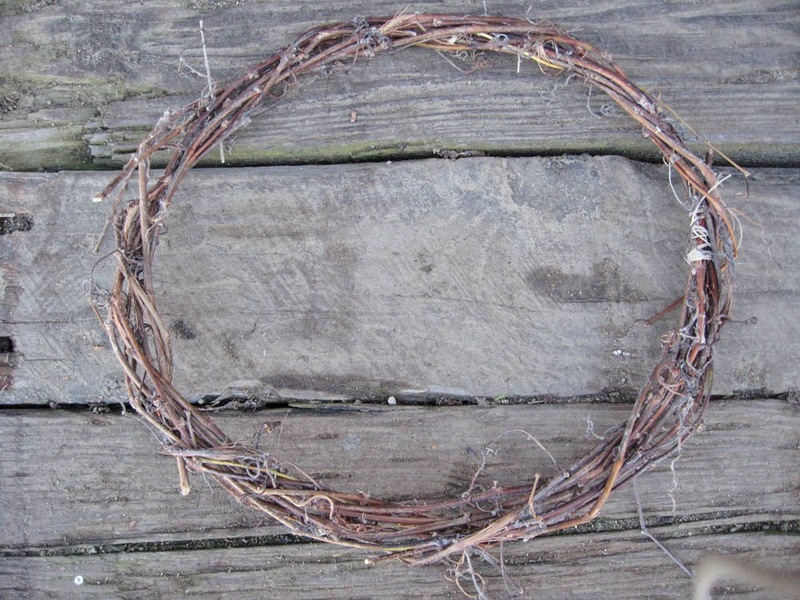 Another easy craft is making a grapevine wreath. Some of you may already have trimmed back your grapevines. 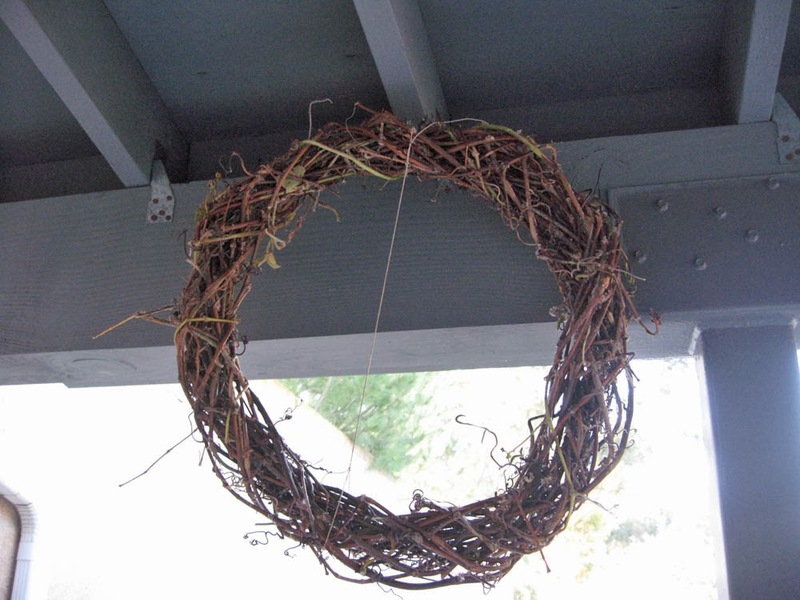 If not, you still have time to make a grapevine wreath this winter (at least in our mild S. California climate). 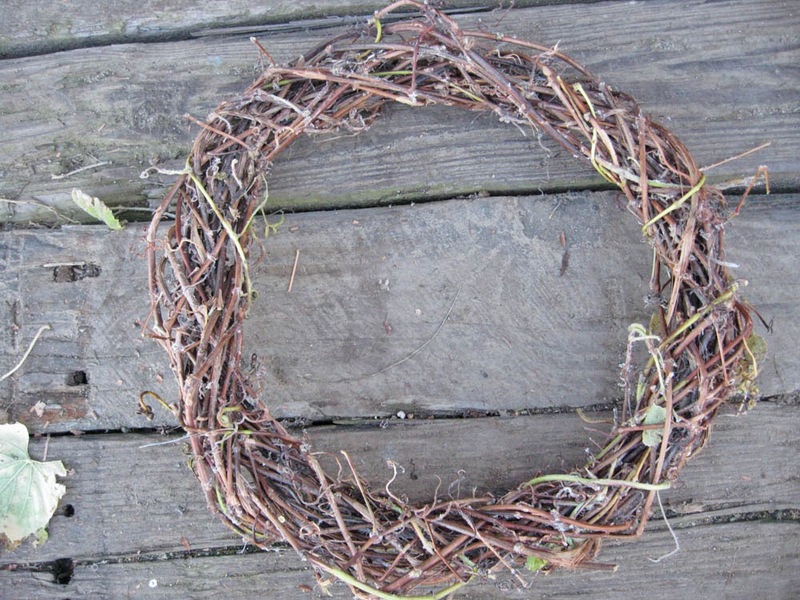 Making a grapevine wreath is easy once you get used to handing the vines. You’ll need 20 to 30 or more lengths of grapevine. Cut them as long as you can – about 4-8 ft. is easiest to work with. Be sure to choose vines that are still flexible (green vines are fine). Vines no thicker than your little finger at the broadest are best. You can see the vines we trimmed from our native wild grape (Vitis girdiana) below. You’ll need to use the vines on the day you cut them, before they dry out. Choose 5 or 6 of the thickest vines to form the foundation of the wreath. 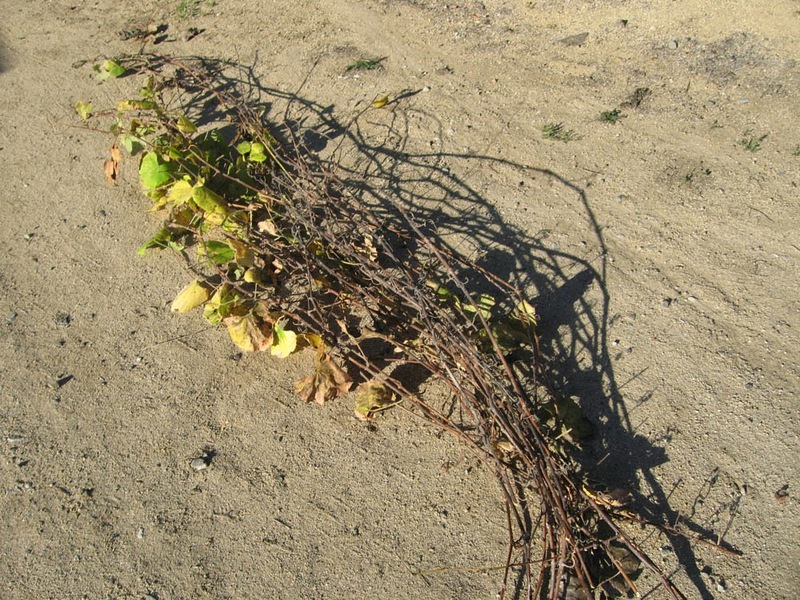 Lay the vines out straight, removing any leaves or side branches. Gently bend the bundle of vines into a circle of the desired size. We suggest about 12 inches across for a small wreath and 18 or 20 inches for a larger wreath. Tie the circle with stout string to hold the shape (see picture below). 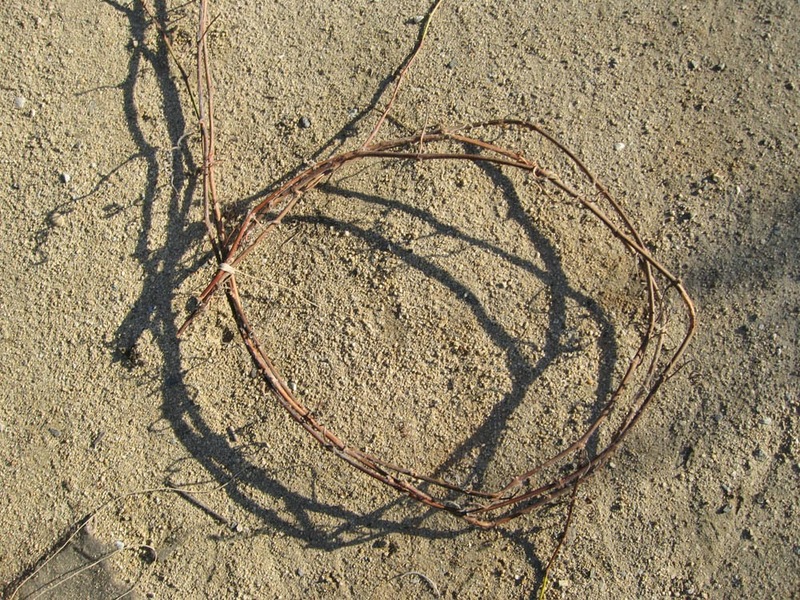 Continue to bend the bundle into a circle, tying as needed to hold the vines in place. You’ll remove the string once the vine dries, so don’t worry about how it looks. Now you have the foundation for your wreath. The foundation may not be perfectly round, but don’t worry about shape too much; the shape will improve as you add more vines. And you can even tweak the final shape just prior to drying. Take another vine and tuck the thicker end firmly into the foundation. Then wrap the new vine around the foundation, making about 6-8 wraps around the circle (see photo above). Wrap until you reach the end of the vine, then tuck the end in. Continue wrapping with the additional vines, starting each new vine at a different place around the foundation. Try to alternate the direction of the wraps – starting clockwise with one vine, then counter-clockwise with the next – to give an even shape. When you’ve used all your vines – or when the wreath is pleasingly full – you are almost done. Don’t worry about the odd ends that stick out. Some will disappear in the drying process, and the rest can be clipped off when dry. If your wreath is not completely round, you can tie it into round with a string (see above). Hang your wreath to dry in a cool, dry place. It will probably take about 2 weeks to dry. Once dry, you can clip loose ends if needed. 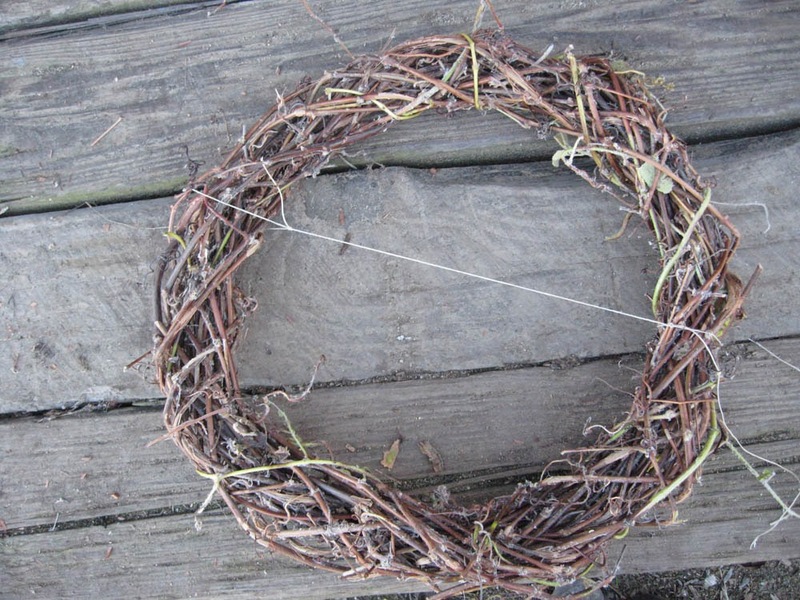 Remove the string – the wreath should hold its shape if fully dry. You can spray your wreath with a thin coat of clear spray varnish or use it as is. We’ll suggest some ways to use your wreath during the next year (2014). Designing Your New California Garden: 7. What Type of Gardener are You? Gardening should be enjoyable. You should want to get out in your garden. While you may not have considered this, the garden itself can determine whether you enjoy or dislike gardening. Since you are designing/redesigning your garden, you have the chance to plan a garden that’s suited to your time, budget and gardening personality. That’s what the ‘New California Garden’ is all about. We all approach gardening in slightly different ways. Certain gardening tasks may bring you great enjoyment, while others seem more like chores. Your ‘New California Garden’ should maximize the former and minimize the latter! But first you need to seriously consider what you like and dislike about gardening. Our questionnaire will help you organize your thoughts. Even the pace at which you install your garden is highly personal. You may want to install your entire garden ‘right now’; alternatively, you may be more comfortable with letting your garden plan develop more slowly. There is no one ‘right way’ – we each need to work within our own constraints and desires. The following two Tables will help you discover elements of your style as a gardener that may influence the landscape plan you develop (http://www.slideshare.net/cvadheim/what-type-of-gardener-worksheet-29222124). Oh joy! Just in time for the cold dark days of winter, the red berries of Toyon (California Christmas Berry; California Holly) are ripening in Mother Nature’s Backyard. Our Toyons are still pretty small, but they hint of future greatness. You may want to consider this quintessential California native for your own garden. Toyon (Heteromeles arbutifolia) can be seen in the wild from SW Oregon to Baja California, Mexico. In California, it grows most commonly in the Coastal Sage Scrub and Chaparral plant communities, but also occurs in Oak Woodlands and even on sandy beach areas away from the immediate shore. Toyons are lowland plants (< 4000 ft. elevation) and are often seen on steep slopes and in canyons locally. 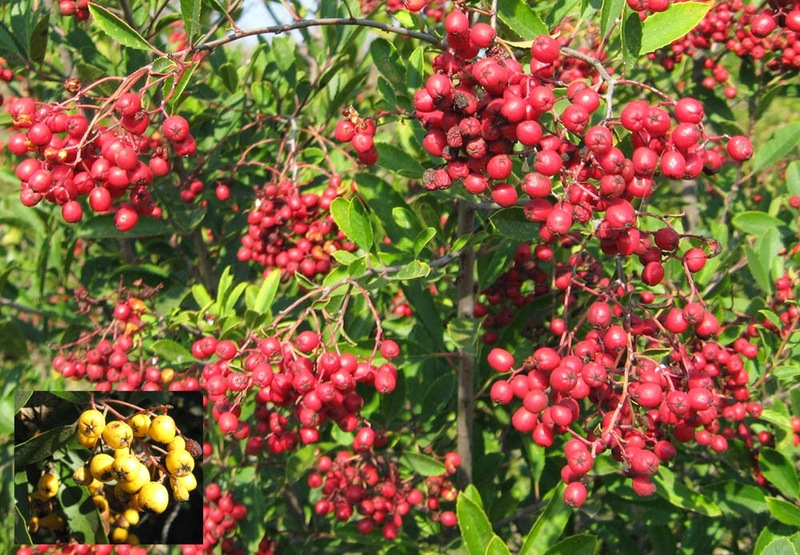 The plants are particularly noticeable in winter, when their red berries are unmistakable. 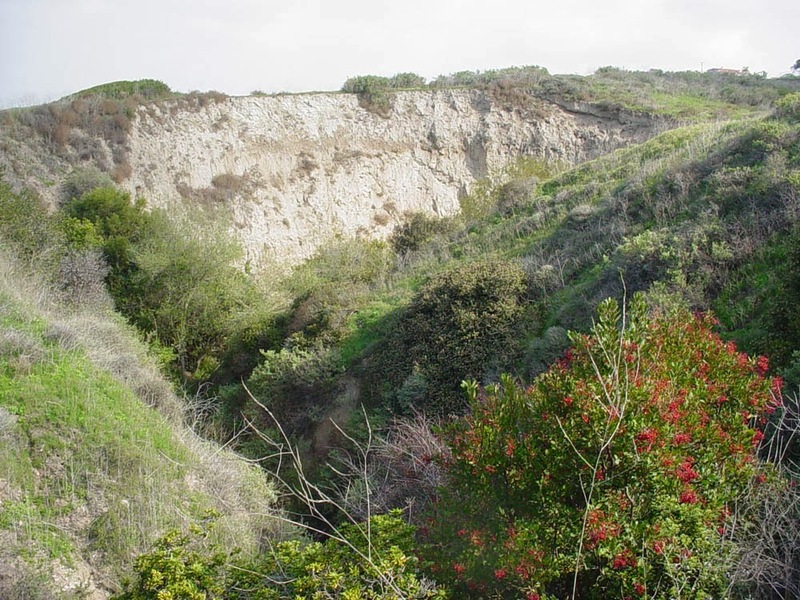 The picture below shows Toyon growing in Malaga Canyon on the Palos Verdes Peninsula. You can also see them on the Southern Channel Islands. Toyon is a large woody shrub to medium-sized tree. Its shape and size are strongly influenced by the amount of light a plant receives. Toyon is unusual in its light requirements: it can grow in full sun, part-shade and even quite shady areas. 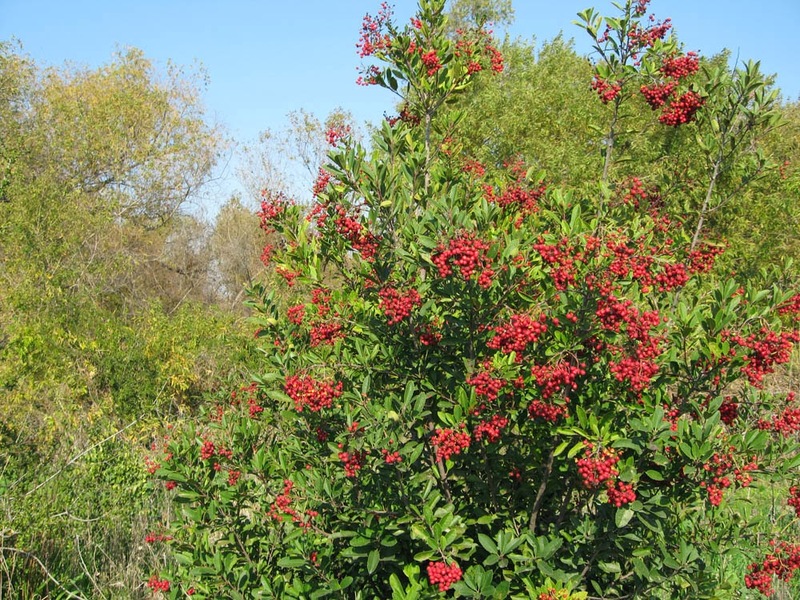 In full sun, a mature Toyon becomes a large, rounded shrub 10-20 feet tall and slightly less wide (see photo below). 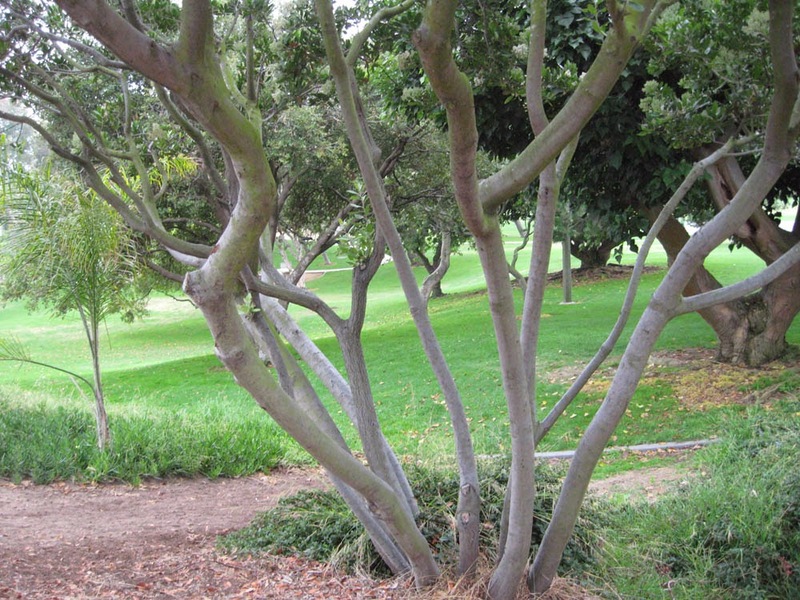 In shade, Toyon becomes more tree-like and can reach heights of 35 or more feet (see photo below). In sun or shade, Toyon is a lovely shrub with neat, medium to dark leaves and evergreen foliage. 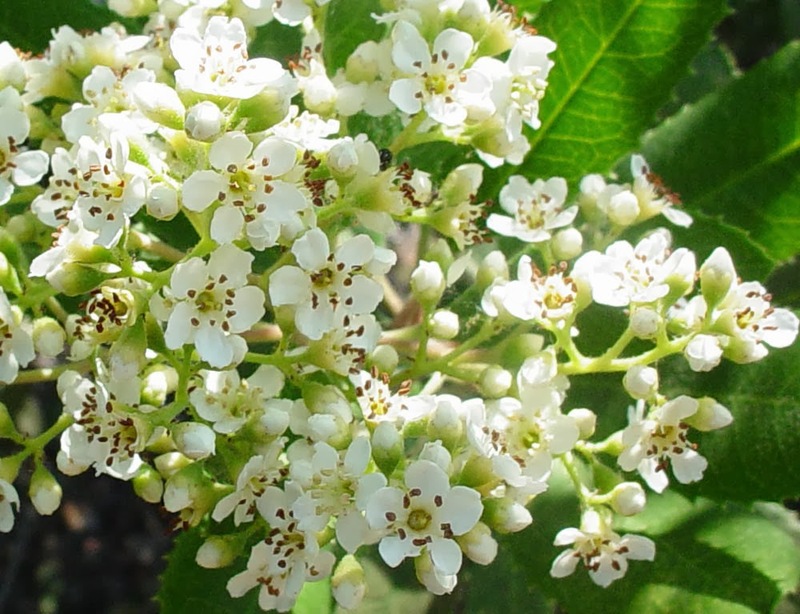 Its tidy appearance, numerous flowers and showy berries endear this native to gardeners throughout California. The leaves are a modest size (2-4 inches long), simple, with serrated edges. The new leaves are bright yellow-green; older leaves are darker green and slightly glossy (see below). The leaves are stiff and fairly thick – part of Toyons’ adaptation to our dry climate. Toyons are dense shrubs with many stout branches. Their shrubby habit make them good choices for hedging. The dense foliage also provides perches, cover and nesting sites for local breeding bird species. Toyon (California Holly; Heteromeles arbutifolia) flowers. Note characteristics of Rose family (Rosaceae). Like many in this family, Toyon attracts a wide range of pollinator insects including native bees, pollinator flies, and even butterflies. The masses of blooms in late spring or early summer are a magnet for pollinators, making Toyon a good addition to a pollinator-friendly garden. In fact, one trick to a successful pollinator garden is to include flowering shrubs and trees like Toyon. Toyon’s fruit also reflects its Rose family heritage. If you look closely at the fruits (see below) you’ll note that they somewhat resemble a small apple (note: apples are also in the Rose family). The fruit shape, red color when ripe and sweet flesh are typical of this family. These fruit characteristics reflect a long history of beneficial interaction between plants and birds/animals. The plants offer a sweet treat, while the birds provide a convenient method for distributing seeds. But the story of Toyon fruits and birds has one more interesting twist. The seeds need to be ripe before the fruits are eaten. To insure this, plants have developed several means to insure that fruits aren’t eaten too soon. 1) The fruits change color to indicate when they are ripe (from green to orange and finally to dark red); 2) they become sweeter as they ripen; 3) unripe fruits produce cyanide and other chemicals that are toxic and/or taste bitter. While Native Californians ate Toyon fruits, we don’t recommend it. Native peoples knew when the fruits were ripe and how to prepare them to remove the toxins. So, let the birds enjoy the Toyon berries – while you enjoy the birds. Among the fruit-eating birds attracted to Toyon are mockingbirds, cedar waxwings, robins, finches, flickers, hermit thrushes, warblers and song sparrows. Often the ripe fruits begin to ferment before they are eaten. So your birds may get a little ‘tipsy’ when eating Toyon fruits. As members of the Rose family, Toyons are susceptible to fungal (and some bacterial) diseases that affect the leaves and roots. The best preventive measure is to plant Toyons in well-drained soils or on slopes – and not over-water, particularly in foggy, coastal areas. Toyons become quite drought tolerant after 2-3 years in the ground. Mature plants need only occasional water – or none at all – in summer (Water Zone 1 to 1-2; Zone 2 on slopes and further inland). 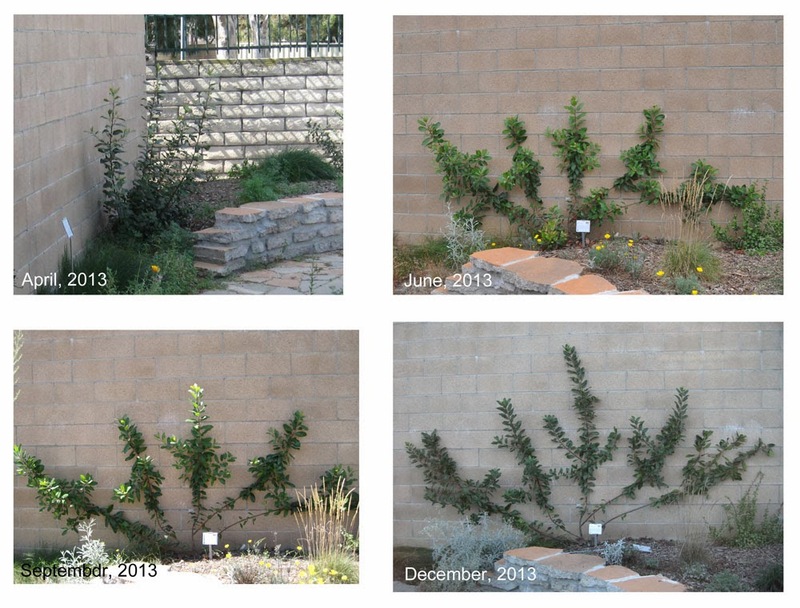 Plants at CSU Dominguez Hills (10 miles from the coast in Carson California) receive no summer water after three years and are strong and healthy. 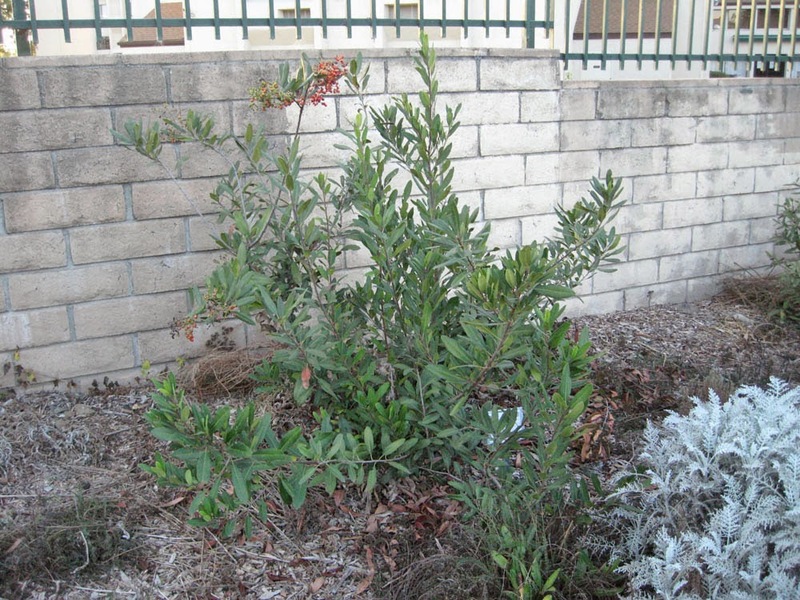 If you have dense clay soil, plant Toyon on a small berm (2-3 ft tall) and water sparingly. 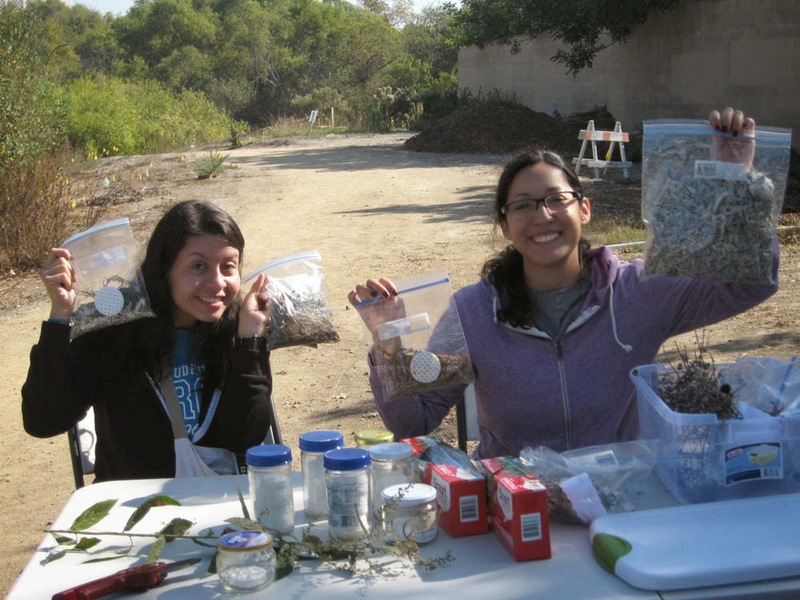 Toyon root systems are net-like and widespread, so they are good for erosion control and Toyon does well growing on slopes. Toyon is happy in un-amended soils and needs no added fertilizer. Toyon is most often planted as a native ornamental shrub. It has a nice natural shape and needs little pruning. But another benefit of Toyon is it’s adaptability. Toyon can be pruned as a hedge or screen (6-10+ ft) and is often included in native mixed hedges or hedgerows (we have one in our hedgerow at Mother Nature’s Backyard). It can also be pruned up into a multi-trunk ‘tree’ (see above). Pruning is best done during dry periods in February-April or in summer after blooming (choose a cool, dry period). Prune as needed during the growth period (spring/summer) if hedge-pruning. Don’t take too much at any one time – and be sure to use sterile pruners. Remember that flowers & fruit occur on older wood; take too much and you sacrifice flowers. Toyon can be trained to grow in narrow spaces. In fact, we are training one as an espalier in the garden (see photos above). When mature, our Toyon espalier will provide flowers and fruits – and hide our cinder-block wall – all in a narrow area about 2 ½ feet deep. Toyon can even be grown in large containers – or as a bonsai. Toyon is yet another example of a practical native plant. Native Californians used a mild tea from leaves to treat stomachache and other pains. It was also used to wash infected cuts and sores. Natural dyers use the leaves, bark, small branches and fruits to create lovely orange and brown colors. Native Californians used the dyes to color fish weirs. 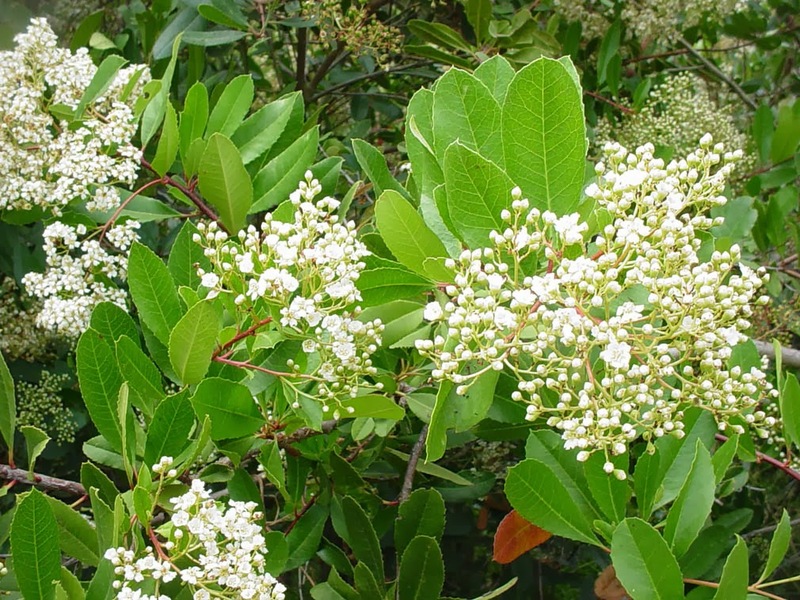 If you use Toyon as a dye, be sure to heat the dye bath out-of-doors; heating releases cyanide chemicals. For more on natural dyes see our October 2013 posting. Finally, the foliage and fruits make lovely additions to winter wreaths, centerpieces and bouquets. That’s another reason to included the ‘Holly’ that made Hollywood famous (Toyon) in your garden. We’ll discuss making a grape-vine wreath later this month (December, 2013). Each garden comes to the present moment with its own unique history. Part of that history is ancient – bound up in the rocks that form its soils, the rivers and volcanoes that shaped its topography and the effects of other natural forces. In the more recent past, the land where your neighborhood lies was host to a number of plant and animal species, as well as the human inhabitants that subsisted on them. In the even more recent past, your garden has a history that includes the development of your property, past gardens/gardening practices and even the current conditions. Learning more about your garden’s past is an important part of designing your landscape plan. Perhaps you have remnant native plant species, such as an oak or Toyon, already growing in your yard. These can form the basis for your landscape plan. As you look around your neighborhood you may find other native relicts that can provide inspiration – perhaps even seeds or cuttings – for your garden. There is nothing more exciting than knowing that you’re providing a home for plants that are native to your immediate location! We also have very useful plant lists available for several local plant communities - see the 'Native Plant Gallery' page on right of screen. You may become fascinated by the ecology of the plants and animals of your area and want to explore further. Learning more about the Native Californians who live in your area can suggest ways to properly manage your native plants. After all, the Native peoples were the first stewards of our native plants! Finally, considering the gardening history of your yard may suggest additional factors to consider when developing your garden plan. Knowing whether fertilizers, pesticides and soil amendments were used, and when, can be useful. Some landscape plants change the pH or other soil characteristics. Knowing the gardening history of your site can help you avoid costly mistakes. Learning about your site’s history can take time and research. Some information will be unavailable. Just do the best you can in filling out the History Worksheet (http://www.slideshare.net/cvadheim/your-gardens-history-worksheet ). File it and old pictures, articles etc. that you discover in your Garden Notebook. Any knowledge of your site’s history will be useful when you – or a designer you hire – designs you New California Garden. If you’ve followed this series from the beginning (July 2013), you’ve come a long way towards designing your New California Garden. If you haven’t seen the previous postings, we suggest you begin with the July posting: Designing Your New California Garden: 1. Why Plan? Last month you developed a ‘Needs & Dreams’ list that contains all the features and functions your family wants in your ‘New California Garden’. You also defined water goals for your garden. Now the creative part begins – you get to play around with different ways to fit the functional clusters into the space you’ve got. One of the easiest ways is to create a Bubble Plan (also known as a Concept Plan or Bubble Map). A bubble plan is simply a map with functional clusters roughly located by outlines (bubbles) of the areas they will occupy. You can draw your bubble plan(s) on copies of your Base Plan 2 (see July, 2013 posting). You’ll need several copies as you’ll likely go through several iterations of your bubble plan. 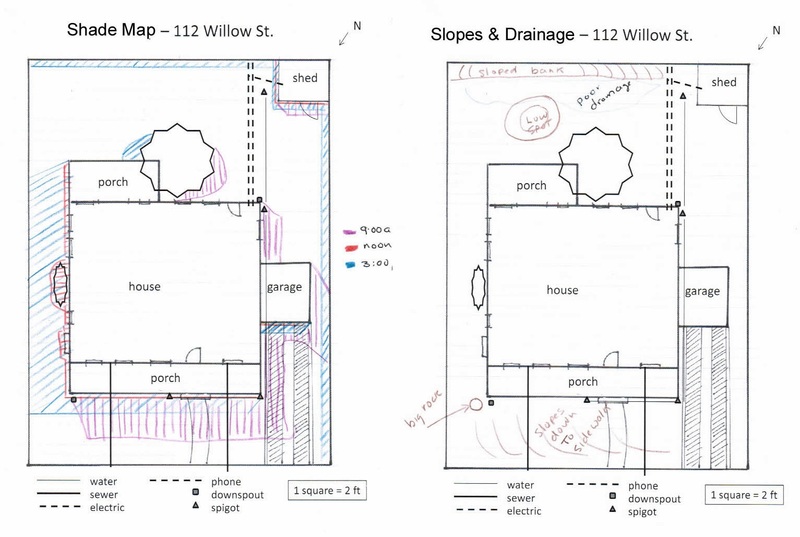 Alternatively, take a sheet of tracing paper and overlay onto a copy of your Base Plan 2. Draw bubble outlines in pencil to suggest where the different use areas might be placed. Be sure to include all the functional clusters you defined last month. Bubble size should correspond to the approximate size of each functional area. For example, if you want a play area for children that is 20’ by 20’, draw your ‘play area bubble’ approximately 20’ x 20’. 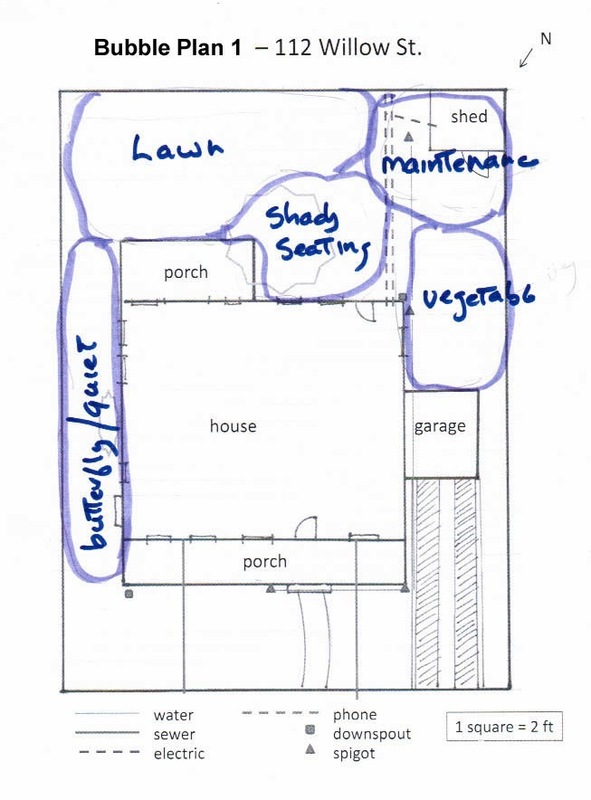 Below is a first attempt at a bubble plan for our example garden at 112 Willow Street. Step back from your bubble plan and look at it critically. The outdoor areas should have a strong relationship with the areas and activities within your home. For example, outdoor cooking areas should be located adjacent to indoor kitchen or dining facilities. Service and storage areas should be located away from main use areas and views from the home – and provide easy access from backyard and front yard if that’s important. Patios and decks should directly tie into main circulation areas from the home. Your bubble plan also needs to reflect the physical characteristics of the garden site (your site’s ‘assets’). If you haven’t yet completed a site physical assessment, now’s the time to do so. 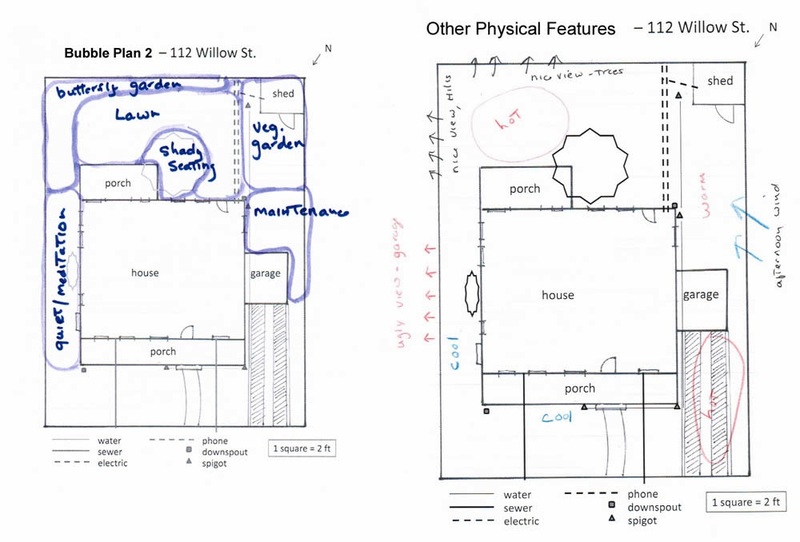 We walk you through the process in our August 2013 posting (Planning Your New California Garden: Site Physical Assessment). When we compare the first bubble plan with our site’s light/shade patterns and other characteristics (see above) we note a few problems. First, the Maintenance Area will be readily visible from the house and garden seating areas. It might be better to move it to the area just south of the garage. This area is less visible and provides access from both front and backyard. We’ll have to build a smaller shed – and sell the old one on Craig’s list – but that’s a much better spot for the maintenance area. There are also some challenges for the Lawn Area. Note the slope on the South side – that will be difficult for a lawn. If we move the Butterfly Garden Area to the sunny slope, it will provide flowers visible from lawn, patio and house. Since butterflies – and their host plants - like sun, this is a better location than the shady east side. If we move the Vegetable Garden to the sunny southwest corner, it will be pretty, functional and also attract butterflies. You can already see the lovely flowers and interesting foliage surrounding the seating areas. 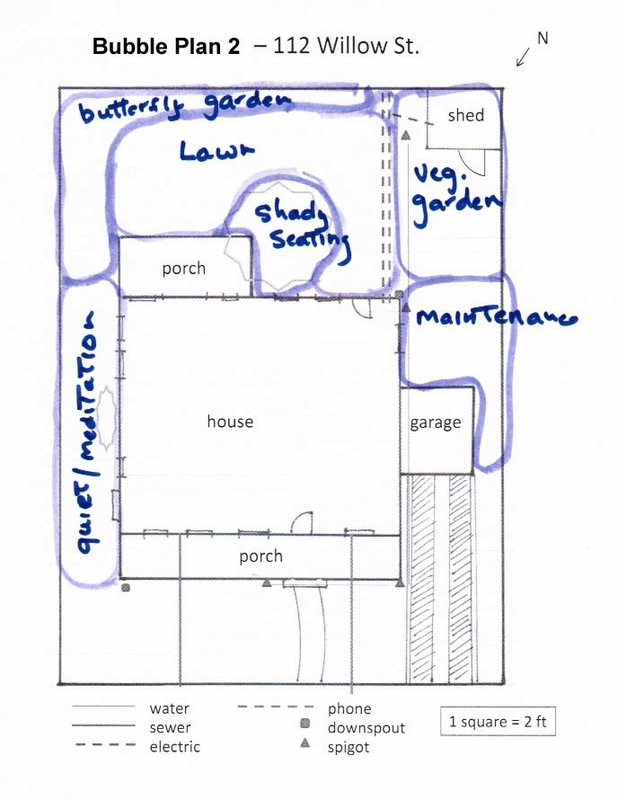 The lawn can fill the space between the Shady Seating Area and the Butterfly/Vegetable Garden Areas. As seen above, this area has a low spot and an area of poor drainage. We’ll have to choose a lawn grass (or grass-like plants) that can handle these conditions. Below is our revised bubble plan. The revised plan has much to recommend it. The maintenance and vegetable garden areas are close to each other – and right out the kitchen door. We’ve got areas of sunny and shady seating. We’ve located our butterfly garden where the butterflies will come and we can watch them. If we need more butterfly plants, we can also plant the showier ones in sunny areas in the front yard. As seen above, the views looking south will be lovely; lawn, a flowery slope and attractive views in the distance. We’ll also get good air circulation with the afternoon breezes. We do have a visual eyesore (the side of the neighbor’s garage) to the east of the quiet/meditation area. We’ll need to do something creative to turn that view into something attractive. Now is a good time to look at gardening books and magazines for some inspiration. You don’t need to spend a lot of money; your local public library likely has lots of resources. 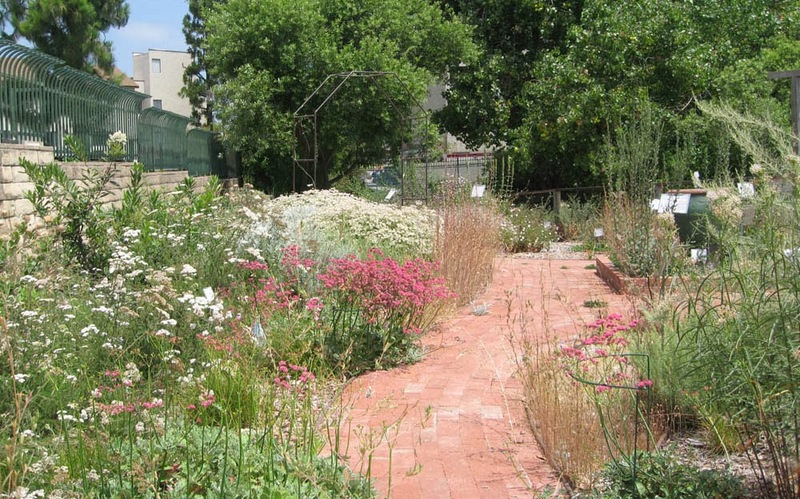 Also visit botanic gardens, demonstration gardens and native plant gardens for good ideas. Get out in nature to see how Mother Nature gardens. Take lots of pictures and notes. You’re going to be glad you did this (fun) background work when we get to next few month’s activities. There are likely a number of workable layouts that will accommodate your functional areas. Some will make better use of space and the physical features of your site. And some will simply appeal to you more than others. We suggest you try several different schemes until the best layout becomes evident. You’ll probably want to work on this over a few weeks, as new ideas may come to you as you work and see other garden ideas. Once you’re satisfied with your bubble diagram, take a copy of your Base Map 2 and create a final Use Areas Map. File the map behind your Functional Analysis Worksheet for reference. Don’t have a garden notebook yet? It’s time to start a binder/notebook for your maps, plans, pictures and notes. We will use these materials in the later sections of this series. Southern California is blessed with a climate that’s perfect for plants with scented foliage. Our native sages (Salvias), mints, roses, California Sagebrush and other Artemisias make our gardens a treat for the nose as well as the eye. Add scented plants from other mediterranean climates – rosemary, thyme, lavender and others – and you’ve got a nice smelling garden. Consider a plant’s aroma when choosing new plants for your garden. You’ll be glad you did! Fall is the best time to prune many scented plants; and pruning can produce lots of trimmings, even in a small garden. Consider using your scented trimmings for garden crafts that produce products unique to your garden. One of the easiest – and fun - is making potpourri. It’s a good activity to do with children (in small groups). You might even want to host a ‘potpourri party’, where guests bring scented materials from their gardens to share. Making potpourri brings out the creative side in all of us. Making potpourri is easy. But like anything involving scent, it allows lots of room for creative expression. No two people smell a scent exactly the same. We all have memories associated with particular scents. And some scents just make us feel relaxed or energized. So have fun combining scents to get just the right combination. Other scented shrubs/herbs: Leaves/stems of Rosemary, Thyme, Lemon Verbena, Lavender, scented Geraniums, Mints, etc. ; flowers like scented Rose petals, Carnations, Orange blossoms, etc. Dry the plant materials. It’s very important that plant materials are completely dry, otherwise the potpourri may mildew. Lay larger materials out to dry outdoors. Turn them every few days until they are dry. Or bundle the stems, tie and hang up to dry on a patio or porch. Flowers, apple and citrus slices can be sun dried, dried on cookie sheets in a warm (less than 130°F) oven or dried in a food dehydrator. Check flowers often – they can dry quickly. Prepare the plant materials. Wearing leather gloves, strip leaves off woody stems of Salvias and shrubby Mediterranean herbs. Place each type of material in a separate plastic bag, seal & label with plant name and date. For California Sagebrush, it’s easiest to just cut the ends of stems into pieces. Other materials need no additional preparation after drying. The leaves simply drop off some dried materials. Dried flowers and fruits are ready to be bagged as is. It’s important to bag your materials as soon as they are dry to retain their fragrance. Choose a primary scent: Now the real fun begins. Making a good potpourri is a bit like making a perfume. You begin by choosing your primary scent. This should be an aroma that you really enjoy. It can be a strong/spicy scent (native California and Mediterranean herbs) or something more mild, but with a fairly strong scent: rose petals, mint, and other garden herbs. This is going to be the primary scent for your potpourri, so take a good handful or two and place it in a plastic bag. We suggest that you write down the names of your ingredients on a piece of paper. You may even want to weigh/measure your ingredients so you can duplicate your ‘signature potpourri’ in the future. Choose 1 to 2 secondary scents: The secondary scents should complement your primary scent. If your primary scent is mild, choose mild secondaries so you don’t overpower the primary scent. Some good secondaries include any of the primaries (in smaller amounts), the dried fruits, dried flowers, mints and perennial garden herbs. If you have scented oils or single-scent perfumes (lavender; rose; gardenia; etc.) you can also use these as secondary scents. Just place a little bit on a cotton ball or cotton pad – a little goes a long way – and place it in your bag of potpourri. Remember to write the materials on your ‘ingredients list’. Close the potpourri bag, shake it well, and let it sit for a half hour or more. This will let the flavors mingle. Open the bag and smell your potpourri. You may decide that your potpourri is just right. If so, it’s ready to use – and you can create another blend. If you decide that your potpourri still needs a little something, smell the secondary scents again; one or more of them may be just what you need. You can also use a little bit of dried spices from your kitchen cupboard. You can add up to 4 additional (tertiary) scents. Once you’re happy with your blend, it’s ready to use. Don’t be afraid to experiment – sometimes unusual combinations are the most successful. If you end up with a truly awful combination, just throw it in the compost bin and try again. It’s fall pruning time and our garden is perfumed by plants recently pruned. Among our favorites is the California Sagebrush, Artemisia californica. More than any other, the scent of California Sagebrush spells ‘California’ for many local residents. You can grow this plant – and have trimmings for garden crafts and cooking – if you’re fortunate enough to live in the lowlands of Central and Southern California. California Sagebrush is endemic (limited in range) to California from Contra Costa County to northern Baja California, Mexico, its range being limited by low winter temperatures. It also grows on the Channel Islands, located just off the California Coast. A plant of lower elevations (less that 2000 ft; more often less than 1000 ft elevation) Artemisia californica is an important member of California’s Coastal Sage Scrub plant community. It is also found in the Coastal Strand and lower elevation Chaparral communities, but it’s an indicator species for Coastal Sage Scrub (CSS). California Sagebrush is best categorized as a sub-shrub – a plant with stems that are woody at the base and herbaceous near the tips. 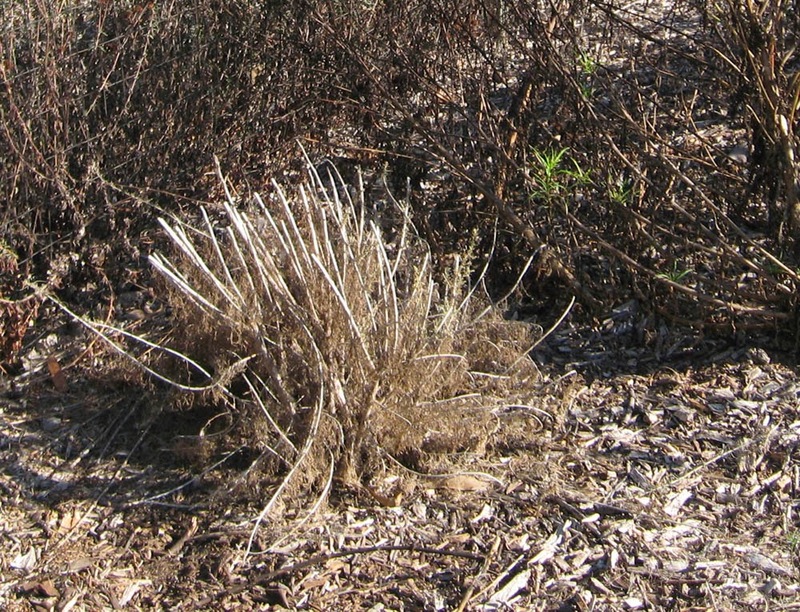 A number of ‘shrubs’ of the CSS are, like Sagebrush, sub-shrubs. They grow quickly, becoming established in a year or two at most. Establishing quickly is advantageous in our climate, which is unpredictable at best. 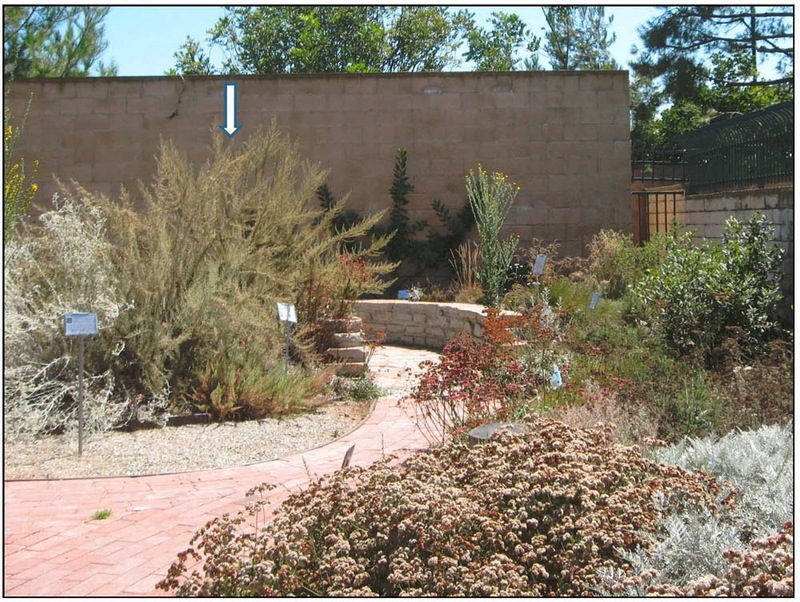 At maturity, Artemisia californica can be as much as 4-5 ft. tall and 4-6 ft. wide. Like many fast-growing native shrubs, it’s not particularly long-lived; even in nature, 25-30 years is ‘old’ for this species. In the wilds, fire plays an important role in the growth and development of Sagebrush communities. Some scientists believe this species needs regular fires, at intervals of perhaps 20-30 years, to ‘clear out the old brush’ and allow it to re-establish. The fire interval is likely important; areas with more frequent fires do not seem to support Artemisia regeneration. Sagebrush plants have many stems from a woody central root crown (see above). The stems are slender and wand-like – an attractive addition to the water-wise garden. In nature, plants may look rounded – almost manicured – due to being ‘pruned’ by wild animals like deer and rabbits. The plants aren’t the tastiest thing around – but they’re better than nothing! Many features equip California Sagebrush for life in our mediterranean climate. They have relatively shallow and fibrous roots, allowing them to utilize soil moisture efficiently. The roots also help bind the soil, a characteristic useful in hilly gardens and restoration sites. California Sagebrush produces two sets of leaves each year: a larger, greener set in winter/spring and a smaller, grayer set on side branches in summer (see photo below). This is also a common adaptation in plants from mediterranean climates. The summer leaves are very drought tolerant. They may appear shriveled and dead, but rehydrate and green up quickly with a summer moisture. The flowers of California Sagebrush are understated (see photo above). They are small, green-gold and resemble little bells along the ends of branches. If you look closely, you will realize that the ‘flowers’ are actually flower heads, typical of the Sunflower family (Asteraceae). Plants can flower at any time, but summer through fall is typical in local gardens. Flowers are primarily wind pollinated, so they don’t need to be particularly showy. They produce many seeds, which also are wind-distributed (if not eaten first by birds). California Sagebrush is easy to grow in just about any local soil. It thrives in full sun to light shade and is very drought tolerant. It is moderately salt-tolerant, but freezing winters will kill it. It gets by fine with no summer water, but looks better if watered occasionally, when the soil becomes dry. You don’t need to worry about fertilizing your California Sagebrush – it’ll do fine without any soil amendments. Plants look better if pruned in the fall (remember the deer and other browsers). We like to prune when plants are beginning to leaf out in October. At that time you can clip with confidence, knowing you won’t harm the plant. You can prune Sagebrush fairly heavily – just be sure to leave 4-5 sets of new leaves/branches on each stem (see photo above). It’s important to prune young plants – even in the year after planting. A well-pruned plant will be lush and full; you will need to prune it less as the years go by. You can also tip-prune (pinch off) the growing branches in spring to achieve greater fullness. 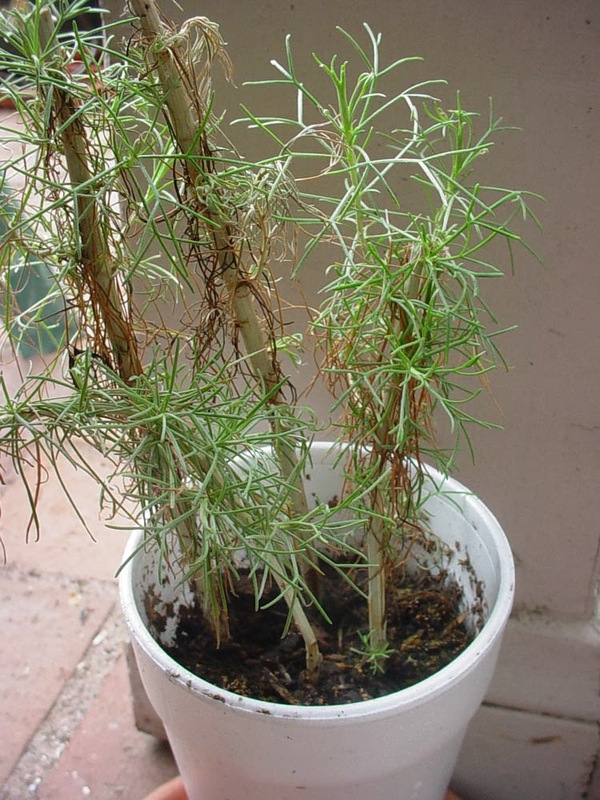 California Sagebrush can be propagated from cuttings. We’ve had best success in June or July, with semi-softwood cuttings 6-8 inches long (see photo above). 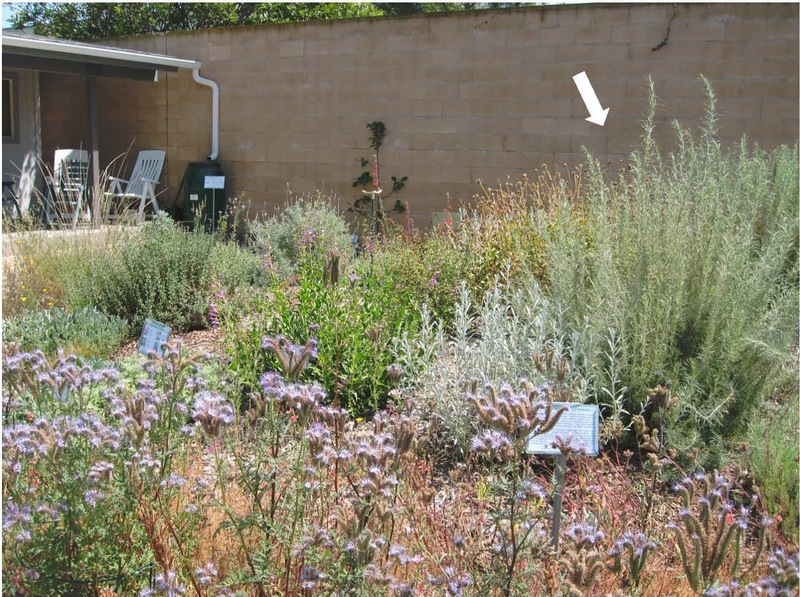 Some gardeners use Artemisia californica as a temporary filler plant, providing cover while slower-growing shrubs mature. This is a good use, but there’s so much more to recommend this plant. 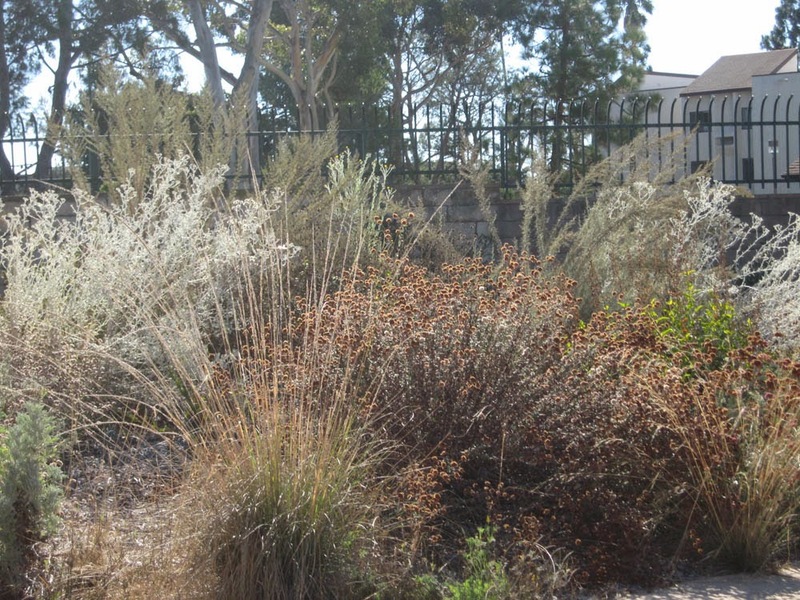 It’s a wonderful habitat shrub, providing cover and even nest sites for birds, lizards and other small creatures. Many of these same creatures also eat the seeds. It’s an excellent choice on slopes and other ‘hard to water’ areas, where it provides hardy habitat. The only drawback is that this species is not fire-retardant – particular if left un-watered. If you live in fire prone areas, plant it away from structures and give it some summer water. Gardeners will also find that few plants grow beneath Sagebrush. Whether because of shade or chemicals produced by the plant, the reason is unclear. We love the look of its feathery foliage, which adds a touch of filmy mystery to spring and fall gardens (see above). It’s color and shape provide just the right contrast to other local plants like Buckwheats and Sages (Salvias). It is a ‘must have’ in any garden that features our beautiful locally native plants. If you like the plant, but would prefer a lower growing or smaller form, the cultivars ‘Montara’ and ‘Canyon Gray’ provide nice alternatives. 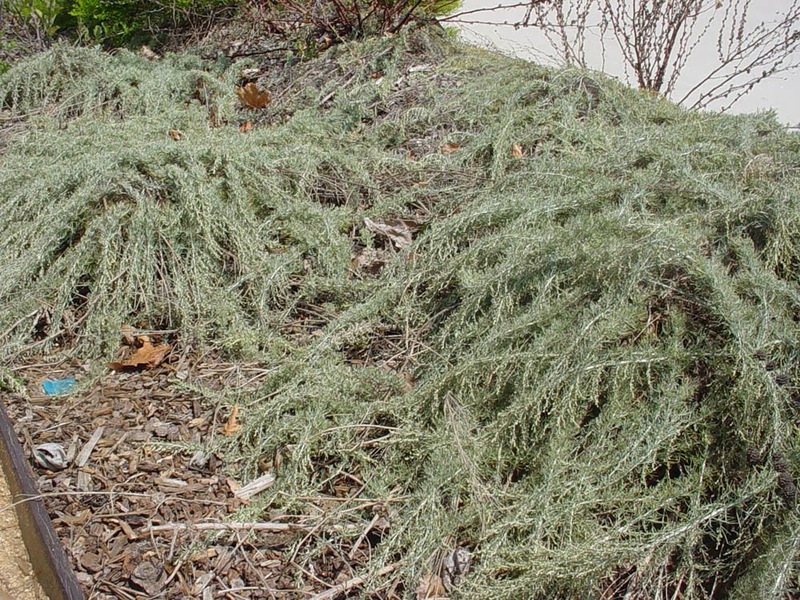 ‘Montara’ is smaller than the species; ‘Canyon Gray’ is a low-growing form that makes a great groundcover (see below). 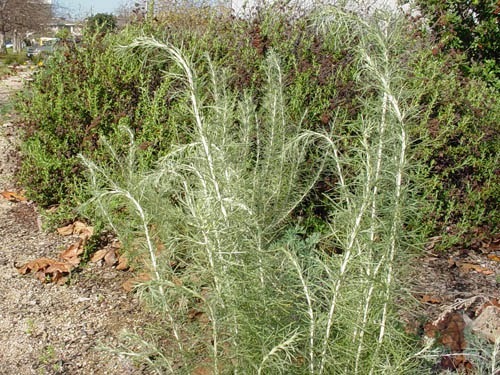 But one of the best reasons to plant Artemisia californica is its aroma. The scent is like no other – pungent, clean and oh so California. We’ve heard it called ‘Cowboy Cologne’ and ‘Cowboy Deodorant’, harking back to days when cowboys encountered this aromatic shrub. You smell it on a warm day, and when you brush against it. And you can use it to make potpourri, seasoned vinegars and as a seasoning, adding zing to stews, soups and more. Both sets of leaves are aromatic, and can be used (fresh or dried) for cooking and crafts. A wand of Artemisia adds a special touch to flower arrangements; a bundle of dried stems makes a good natural room freshener (we suggest putting it in a cloth bag to prevent a mess). More on making potpourri later this month (November 2013). The unique scent of California Sagebrush is due to a whole palette of plant chemicals. 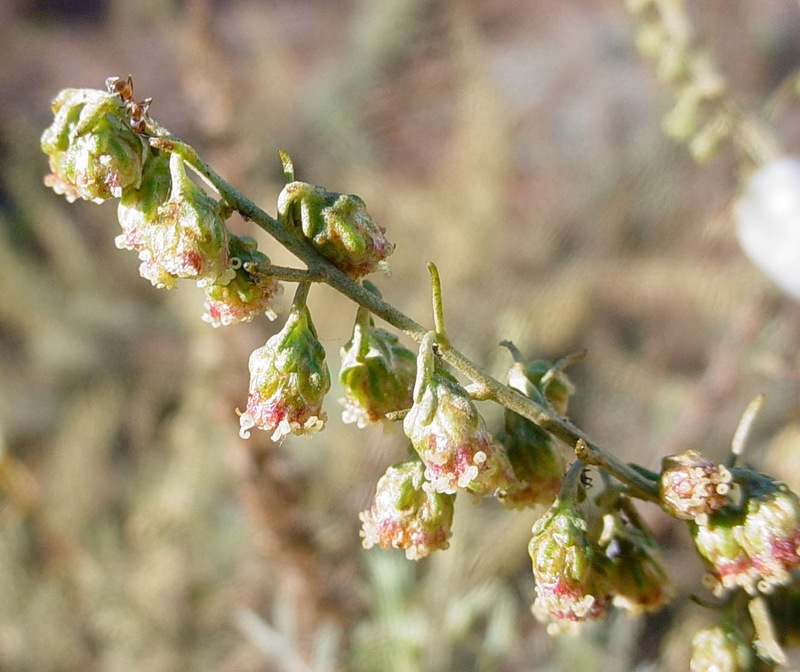 While produced to discourage herbivores, protect against infection and help the plant burn better, these chemicals produce the signature fragrance that we think of as ‘Artemisia californica scent’. Native Californians used this plant extensively as a ceremonial and medicinal plant. The plant was often used in ceremonies for life transitions – and for ritual purification. Leaves were rubbed on the bodies of hunters to disguise their scent. Tea made from leaves was used to treat colds, fevers and to wash wounds. Pounded leaves were used to disinfect cuts and were also chewed or smoked for cold symptoms. And branches were hung up to freshen the air. The leaves are also purported to drive away fleas (early settlers put them in their beds for this purpose). What an amazing plant!